I spent most of the day today uploading pictures from my phone to Facebook. Apparently that's really annoying to all your facebook friends. Whoops. So now all my albums are just for me to see until I get done playing around with them. I'm so tired of seeing the "icloud is full" message so and I'm sure my computer is going to die at some point so taking advantage of FB's free storage while it lasts. I deleted all but about 20 pictures and my icloud is still full so I'm assuming that has to update somehow. So now I'm updating my IOS which probably means that something will kill my phone. I try to wait as long as possible to do the updates. Last time I tried it failed because my "icloud was full" lol so we'll see what happens now. I really don't want to pay ANYTHING more a month for my phone since I already have a car payment size bill. Work was so dead today I had like 2 things to do. Save one for tomorrow lol. The girl who sits next to me was having stomach issues and stayed all day. I kept hoping she'd just leave because that's the worst thing to have happen at work. She has some stomach issue history but she drinks a couple gallons of caffeine every day and takes a bunch of pills all the time so it's not like she's trying to keep it away. After work I ran to the little mexican grocery store down the street from work and got something to take to Bingo since it was potluck night. I didn't win anything all night. Some days you win, some days you lose I guess. Oh here's a fun picture I saw going around today. It has something about a Proposition 10 that I need to look at still. 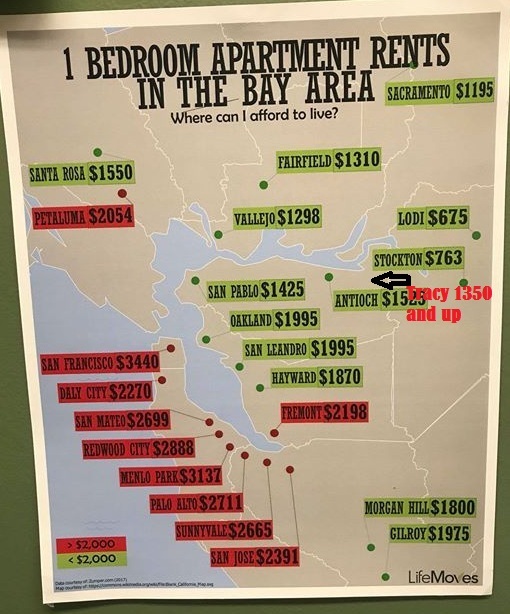 I just looked up a 1 bedroom apt in Tracy and the lowest one I found was $1350 for an apartment building that my sister in law rented for $500 a month 18 years ago. So yeah that was awhile but that also means they are OLD. My kids are going to live here forever, who can afford to move out?